It claims Cochran “voted with Harry Reid to make amnesty for illegal immigrants possible” in 2006. But Cochran voted that year against the comprehensive immigration bill, and he voted against similar bills in 1986, twice in 2007 and again last year. It suggests Cochran is paying lip service in his opposition to the Affordable Care Act, because he “accept[ed] a special exemption for himself and his staff.” Cochran voted against Obamacare, and he and his staff are on the Washington, D.C., health insurance exchange created by the law. The ad says his votes for the debt ceiling cost Americans $58,000 per person. Cochran voted to increase the debt ceiling by a total of $11.1 trillion over 33 years, but that comes to $34,895 per person – not $58,000. Tea Party Patriots Citizens Fund has begun airing its 30-second TV spot called “What Happened to Thad Cochran?” statewide on broadcast and cable TV, and plans to run a 60-second radio version as well. Cochran voted against 2013’s Border Security, Economic Opportunity, and Immigration Modernization Act, which passed the Senate but has been blocked by the House. We reached out to Cochran’s campaign for an explanation of those votes and did not hear back. But the important thing to note is that Cochran ultimately voted against the Comprehensive Immigration Reform Act of 2006. In fact, Cochran has consistently voted against comprehensive immigration bills that include a path to citizenship for those people currently living in the U.S. illegally. That includes votes in 1986, 2006, two in 2007, and finally last year’s Border Security, Economic Opportunity, and Immigration Modernization Act. The narrator in the Tea Party Patriots ad also calls into question Cochran’s bona fides in opposing the Affordable Care Act. “He says he opposes Obamacare, but he accepts a special exemption for himself and his staff,” the narrator states. We’ll start by noting that Cochran does more than “say” he opposes the Affordable Care Act. He voted against it. Cochran also voted in March 2013 for an amendment from Sen. Ted Cruz “to establish a deficit-neutral reserve fund to provide for the repeal of the Patient Protection and Affordable Care Act and the Health Care and Education Reconciliation Act of 2010 and to encourage patient-centered reform.” It failed 45-54. And in February 2011, Cochran voted for an amendment from Sen. Mitch McConnell to a transportation bill that sought “to repeal the job-killing health care law and health care-related provisions in the Health Care and Education Reconciliation Act of 2010.” It failed 47-51. Cochran also has voted in favor of defunding the ACA, such as his vote on March 13, 2013, in favor of an amendment offered by Cruz “to prohibit the use of funds to carry out the Patient Protection and Affordable Care Act.” It failed 45-52. Cochran was also a co-sponsor of the self-explanatory ObamaCare Repeal Act, which was introduced in January 2013. We could go on, but you get the idea. Cochran has done more than “say” he’s against the Affordable Care Act. He voted against it, and has voted to repeal and defund it. As for the claim that Cochran “accept[ed] a special exemption [from the ACA] for himself and his staff,” we’ve dispelled that canard on numerous occasions. Cochran and his staff went into the D.C. exchange created by the Affordable Care Act. The federal government continues to pick up 72 percent of federal employees’ premiums on average — just as it did before the ACA. But that’s not a “special exemption.” Most large employers pay a portion of health care costs. Raised Debt $58,000 Per Person? The ad also exaggerates the impact of Cochran’s votes on the debt ceiling. It says he has voted to increase the federal debt 24 times. “That’s $58,000 per person,” the narrator says against the backdrop of a family of four. That overstates the actual per capita amount by about 40 percent. There are currently 318 million people in the U.S., so 318 million times $58,000 would equal a total debt of about $18.4 trillion. But that’s too high. The total federal debt, which includes money that the government owes to itself, is $17.5 trillion, and the debt held by the public is $12.5 trillion, according to the U.S. Treasury website. How much did Cochran vote to increase the debt? The ad says he voted 24 times, and the tea party group provided us with a list of the 24 votes, from 1981 to 2013. 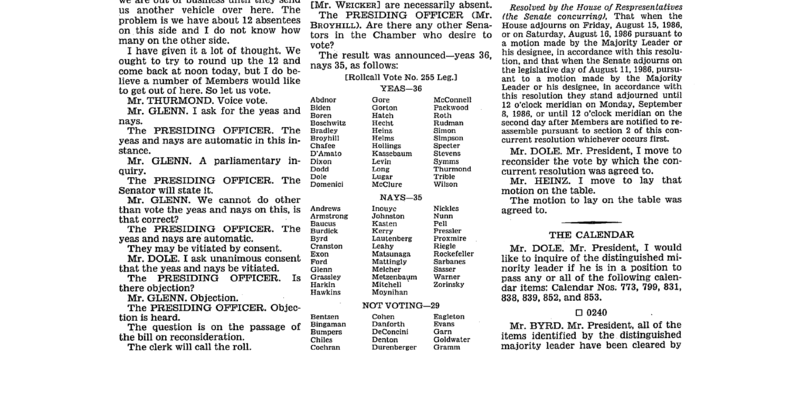 But that list mistakenly claims Cochran voted to increase the debt limit by $32 billion on Aug. 15, 1986, when in fact Cochran was among 29 members who were absent that day and did not vote. The debt-ceiling bill barely passed 36-35. That would mean Cochran voted 23 times to raise the debt ceiling at a total cost of $11.1 trillion. That comes to $34,895 per person.